Which flavor floats your boat? All photography courtesy InterContinental Hotels. CAPSULE REPORT: There few things better than a scoop of ice cream on a hot summer day—except maybe a scoop of ice cream served in a cold glass of soda, otherwise known as an ice cream float. 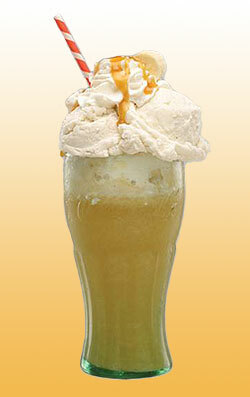 Recalling images of 1950s Americana, ice cream floats symbolize a return to simpler times. You can leave the innocence to the kids and transform an ice cream float into a sweet dessert cocktail with the addition of spirits. Here, we present two cocktail floats and four traditional float recipes, courtesy of The Barclay Bar & Grill at the InterContinental Hotels ~ New York Barclay, which is featuring them throughout the summer. This is Page 1 of a 2-page article. Click on the black links below to view the other recipes. According to food historians, the first ice cream soda was created by accident at the Philadelphia Exposition in October 1874. It was there that pharmacist Robert M. Green invented the now-familiar ice cream soda. At that time, at soda fountains in pharmacies across America, the pharmacist or an employee known as a soda jerk (because he had to jerk back the tap of carbonated water to make a soda) would create a “cream soda” by adding a tablespoon of vanilla or other flavor of fountain syrup along with a tablespoonful of heavy cream to soda water. As with most stories, there are multiple variations. One version says that the fountain ran out of fresh cream. As there was no cream in the vicinity, Mr. Green got vanilla ice cream from a nearby vendor. He planned to let it melt and use it as cream, but was so busy that instead he added a frozen spoonful directly to the cream soda. In another version, he ran out of ice and used the ice cream to cool the drink. However, in his own published account, (in Soda Fountain magazine in 1910), he recounted that while operating a soda fountain at the Franklin Institute’s sesquicentennial celebration in Philadelphia in 1874, he wanted to create something that would attract customers away from another competitor. During some deliberate experimenting, he added ice cream to the soda water. Whatever the genesis, the ice cream soda was an instant hit and spread nationwide, where they were also called floats (for the scoop of ice cream floating at the top of the glass). 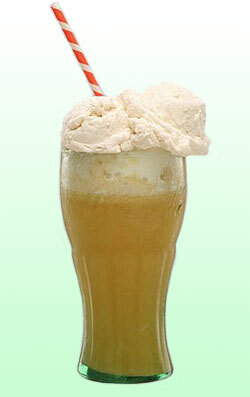 The second phase of the ice cream soda is the adult version—with alcohol. Here are two delicious recipes, followed by a page of traditional recipes for those who prefer their ice cream soda zero-proof. Put approximately 2-1/2 scoops of vanilla ice cream in a tall glass. Pour rum and liqueur over top of ice cream. Top with whipped cream (and optional caramel syrup). Put approximately 2-1/2 scoops of vanilla ice cream in a glass cup. Pour vodka and liqueur over top of ice cream.